Charles "Kenny" Brown, part Choctaw indian, was born in Little Rock, Arkansas in 1928. He moved to California with his mother at the age of thirteen. Following his discharge from the army, he started his own group, Kenny Brown and the Arkannsas Ramblers. In 1955 he was signed to Pep, who issued several singles by the group, including the original version of "Crazy Arms." 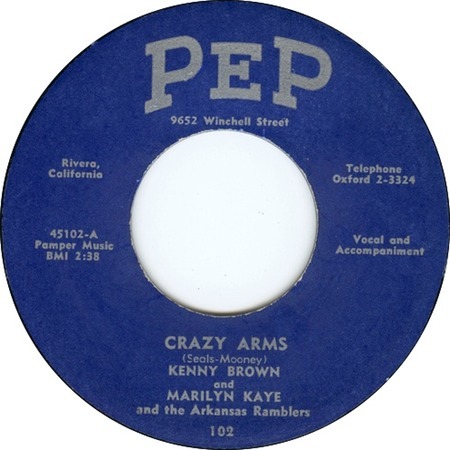 Probably best known from Ray Price and Jerry Lee Lewis's 1956 recordings, this number was first recorded the previous year (exact date unknown) by Kenny Brown and Marylin Kaye and The Arkansas Ramblers for the Pep label of Rivera, California (PEP 102). Elvis's version was recorded during the jam session at the Sun Studios, known as "The Million Dollar Quartet." Jerry Lee Lewis (The Killer) was at the session, along with Carl Perkins and Elvis (Johnny Cash was there for at least some time, but it is not certain that he was actually caught on tape) and he recorded "Crazy Arms" too.